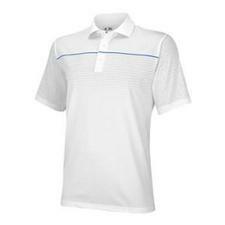 Adidas Puremotion Climacool Digital Stripe Polo - White/Vivid Blue Z83771 - $24.99 - GolfersEdgeOnline.com - Best Golf Equipment On The Web! The Puremotion Climacool Digital Stripe Polo is quietly confident and committed to winning as you are. The ClimaCool fabric handles moisture with ease, and is exceptionally fast-wicking and highly breathable. If you have any more questions about the Adidas Puremotion Climacool Digital Stripe Polo - White/Vivid Blue Z83771; do not see the model you are looking for; need custom options; or prefer to not purchase online, then please call us at (630) 656-1291.